Yesterday I installed my first no-cook candy board. I based it on Anita Deeley’s recipe on the Beverly Bees blog. The box is built from utility 1″x4″. I predrilled the nail holes to avoid splits and used an exterior grade glue. The corner joins are not as nice as the finger joints on standard hive bodies, but they are adequate for this purpose and more in line with my limited shop skills. 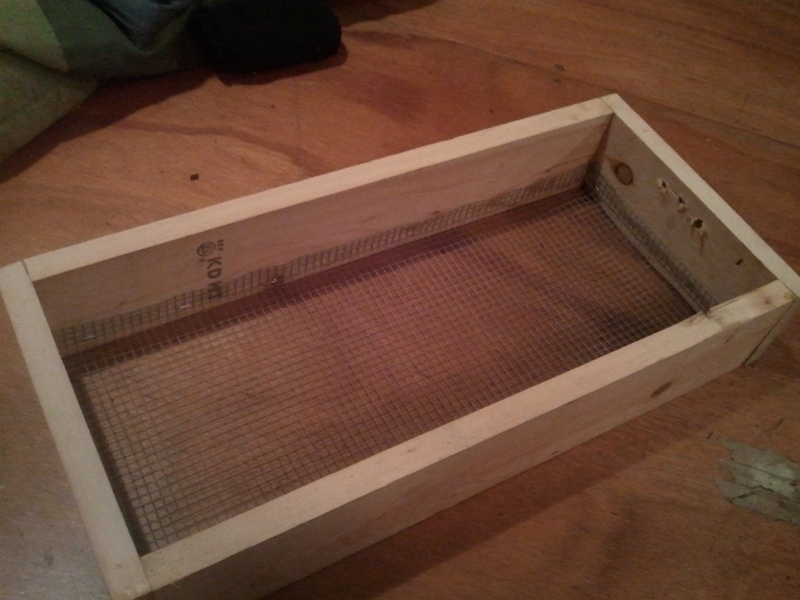 I used 1/4″ hardware mesh instead of Anita’s 1/2″ because it was what I had on hand. Quarter inch holes were drilled in one end for ventilation, which were then covered with a bit of window screen to keep out robbers. For this tiny nucleus colony, I scaled down the candy recipe to 4 pounds of sugar and 3/4 cups of water. 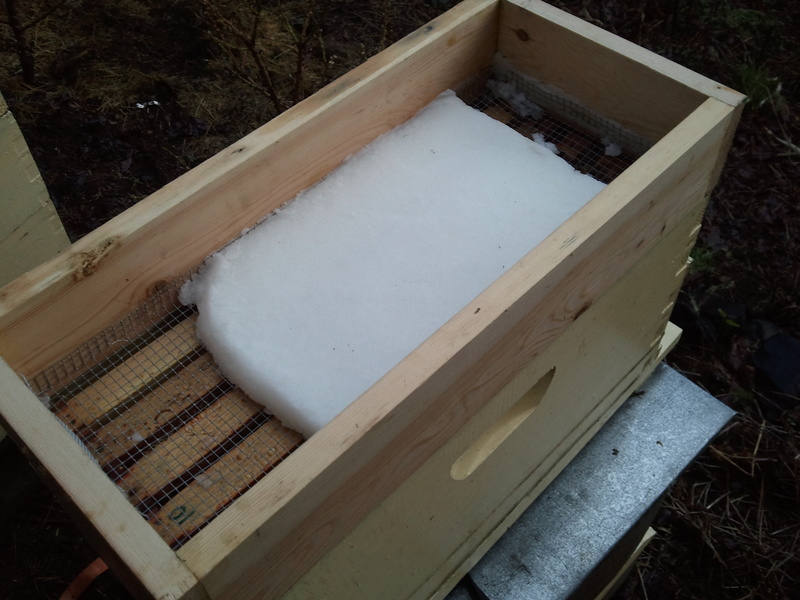 The recipe is interesting because the water and sugar are simply mixed well, packed onto the the mesh, and allowed to dry for 24 hours–no cooking! 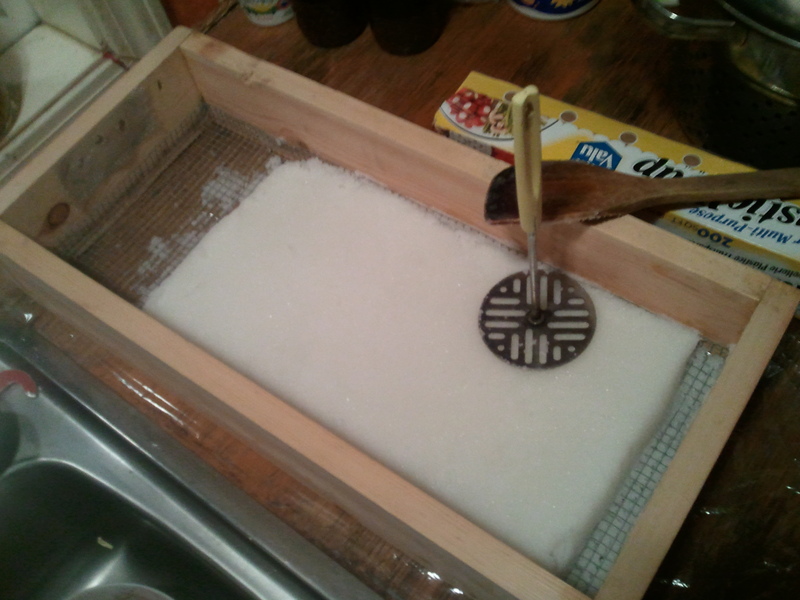 The result is a handy slab of sugar not unlike a large sugar cube. Ideally, I would have painted the box before installation, but I wanted to get this colony some extra food without delay. 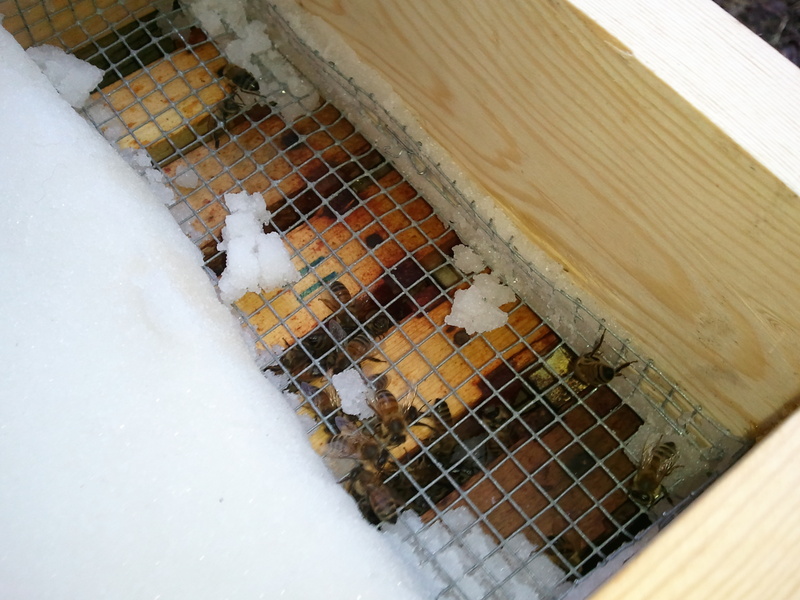 The bees have been so much more active because of our recent unseasonably warm weather that they are consuming more of their stores as a consequence. I think a towel screen above the candy to help with condensation might be a nice future addition. Today’s quick peek in the hive showed at least a nibble of interest; we’ll see how they do as the winter goes on!